Great feed backs from great people, who have some problems to show up with real name and their great questions on a popular forum. So here one question, which repeated itself over the last few days over and over again.
" To we have a picture or print, where we have comparison between a " physical , classical guided interval workout and a physiological guided workout.
" Answer : sure here it is. The first sets you can see are fixed 1 min interval repetitions with same load same duration and same rest period. Short recovery and than a physiological guided workout with the target to hit the same deoxy levels. See the change in recovery time and loading time. Got a nice mail based on this info. In short : Can you show a typical way, on how you would integrate MOXY in track and field or any sport , where interval is a common training idea. Short answer for now Yes and stay tuned as I have to go back to some old testing and options we did a few years back with Portamon and than you can see hwy MOXY will be the choice for teams and coaches in sports like soccer, Ice hockey but as well track and Field as the perfect guide for great individualized interval ideas. Another area we tried different things a few years back is hypoxia or altitude response, ionce we combined it with Spiro Tiger. Shapiro's definition of Bioavailablity of oxygen is a great way to explain or describe why MOXY and NIRS are so great to play with. Okay part 1 in between clients here. Look at for the moment just on red. O2Hb or how the oxygenation trend takes place. With MOXY we would take SmO2. First series is a complete re-oxygenation workout. set 2 is an incomplete re oxygenation and third set is a super compensation of oxygenation. The ideas are very different in between this workouts and some people immediately will see, how we may be able to stimulate ideas like MCT1 and MCT 4 dynamic. Depending what you do in between the individual set in one load you may be able to accumulate more lactate than usual but balance your H + situation. This later when we advance. So here first just the picture of the three intervals. Aim: Aim of our study was to evaluate the effects of interval exercise training (IT) programs, regarding whole body oxygen uptake and peripheral tissue oxygenation, in Chronic Heart Failure (CHF) patients during recovery. Methods: Twenty-six CHF patients (21 males/5 females), mean age of 49 ± 12 years, participated in the study. Fifteen patients were assigned to IT and 11 patients were assigned to IT followed by strength training. All patients were trained for 40 minutes per session, 3 times per week, for 12 weeks. They performed a symptom-limited cardiopulmonary exercise testing (CPET), before and after the completion of the program. Muscle tissue oxygen saturation (StO2) of quadriceps femoris was continuously measured by Near Infrared Spectroscopy (NIRS) during CPET and during the recovery period after the end of exercise. Results: No differences were noted between the two patient groups regarding whole body and peripheral tissue oxygenation indices and, therefore, data from all patients were pooled. 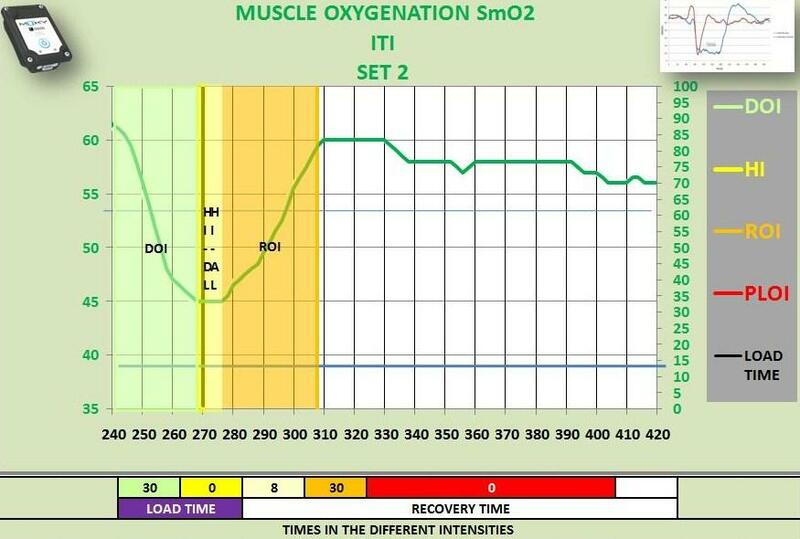 After training, an increase in peak oxygen uptake (17 ± 4.5 to 19 ± 5.5 ml/kg/min, p < 0.05), gas exchange threshold (11 ± 3.5 to 12.5 ± 3.5 ml/kg/min, p < 0.05), peak work rate achieved (105 ± 29 to 124 ± 37 Watt, p < 0.05) and the first degree slope of VO2 at the first minute of recovery (0.45 ± 0.2 to 0.61 ±0.3 L/min2, p < 0.05) was noted. In addition, tissue re-oxygenation time constant was decreased (65 ± 25 to 52 ± 28 sec, p < 0.001). Conclusion: In conclusion, interval exercise training accelerates oxygen uptake and peripheral tissue oxygenation during recovery from exercise in CHF patients. Here a gym session where I tried to have a SmO2 guided session. Interestingly on the run where I increased speed there was three alarm and recovery phases (tHB reacted differently on the first 2 alarm phases?) before things settled. Goal of the session is local muscular endurance, squat jumps with same weight throughout and workload through out should be maintained. First set was a traditional set to see what happens each little dip is 10 jumps. Rest perioed would normaly be about 10 min but SmO2 showed recovery so went again, Rest was about 2 maybe 3 min. Second set SmO2 guided, 17-20 reps and varied according to SmO2, and recovering to a base line. Third set 15-20 reps didnt allow the same recovery to see what happens and I gradually could not maintain SmO2 anymore and reps dropped also. How do you do your sessions and what is your goal in the session with SmO2? 1. The second MOXY guided set. : If it would be MOXY guided, why did the SmO2 not dropped down to the first low SmO2 value. So if it would be MOXY guided it would look like the fist Moxy guided one. Where you simply not able anymore to go all the way down and went to the level as low as possible or what was " guided "
2. Now the big question and the straight forward answer. What do we do now , once we have this MOXY guided idea running . What training causes what changes. That's where we need open minded MOXY users and coaches and individuals. a) We now w with MOXY have a tool, where we can "load " physiological the body and repeat the same physiological load . We have a physiological guided workout rather a physical guided workout. If I make a interval based on wattage I may load every time the same wattage let's say 5 x 300 Watt with 2 min break. This means , that I have 5 time the same physical load and the same physical recovery. With MOXY I may load x time down to 35 SmO2 and wait x time till I am back up to base line 65 SmO2. The amount of repetition is given , whether I still can repeat the same load after the same SmO2 recovery. How much wattage do I loose or gain with the same deoxygenation effort and how is the time duration of the rest period back to 65 SmO2 changing. If I do the physical guided workout I know I repeat the same physical performance, but I have no clue , what systems may react differently in each set on the same physical performance on a given day. So the physiological stimulation may be every workout session very different due to limiter and compensator reaction. the end result , what ever it may be is an end result where I have no clue how I got to that result and what I changed in my physiological reactions. If I am able to have a better performance, than I am happy, if I am worse or no improvement, than I may change the coach or my coach may tell me that I reached my genetically potential. With the psychological guided idea I know exactly what I loaded and how long and how deep I pushed the systems. Now if I see progress I know why , because I have the information on the load in my physiological system. If I make no progress or I am getting worse I know hoe the physiological system reacts now and why my wattage is on a higher level same or a lower level. That means that I know that the current stimulation I apply is in fact a stimulation with a subsequent physiological reaction for progress or stagnation or even overload and decreased performance. So yes I need both objective performance but I like to back that up with physiological information on how I created this " objective " performance. I have a HR today of 150 beats. Tomorrow I push again 250 wattage an have a HR of 165 ?? I push 250 wattage and have a respiratory frequency of 40 breathe / min. Tomorrow I push 250 wattage and have a respiratory frequency of 34 breath per minute. ???? Tomorrow I push 250 wattage and have a Sm of 45 - slightly dropping and a tHb slightly dropping. Now I could combine the tree examples and I would have a great opportunity to understand why 250 wattage is the same physical load but a very different physiological stimulation at a give time under certain situation based on the recovery of Limiter and compensator.